Is George Orwell the most influential writer who ever lived? Yes, according to John Rodden (TM)s provocative book about the transformation of a man into a myth. Rodden does not argue that Orwell was the most distinguished man of letters of the last century, nor even the leading novelist of his generation, let alone the greatest imaginative writer of English prose fiction. Yet his influence since his death at midcentury is incomparable. No writer has aroused so much controversy or contributed so many incessantly quoted words and phrases to our cultural lexicon, from oeBig Brother and oedoublethink to oethoughtcrime and oeNewspeak. Becoming George Orwell is a pathbreaking tour de force that charts the astonishing passage of a litterateur into a legend. Rodden presents the author of Animal Farm and Nineteen Eighty-Four in a new light, exploring how the man and writer Orwell, born Eric Arthur Blair, came to be overshadowed by the spectral figure associated with nightmare visions of our possible futures. Rodden opens with a discussion of the life and letters, chronicling Orwell (TM)s eccentricities and emotional struggles, followed by an assessment of his chief literary achievements. The second half of the book examines the legend and legacy of Orwell, whom Rodden calls oeEngland (TM)s Prose Laureate, addressing everything from cyberwarfare to oefake news. 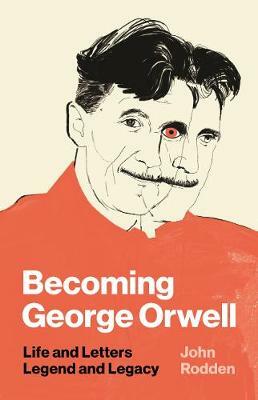 The closing chapters address both Orwell (TM)s enduring relevance to burning contemporary issues and the multiple ironies of his popular reputation, showing how he and his work have become confused with the very dreads and diseases that he fought against throughout his life. John Rodden has taught at the University of Virginia and the University of Texas at Austin. His books include The Cambridge Companion to George Orwell, The Cambridge Introduction to George Orwell, and The Politics of Literary Reputation: The Making and Claiming of oeSt. George Orwell. He lives in Austin, Texas.